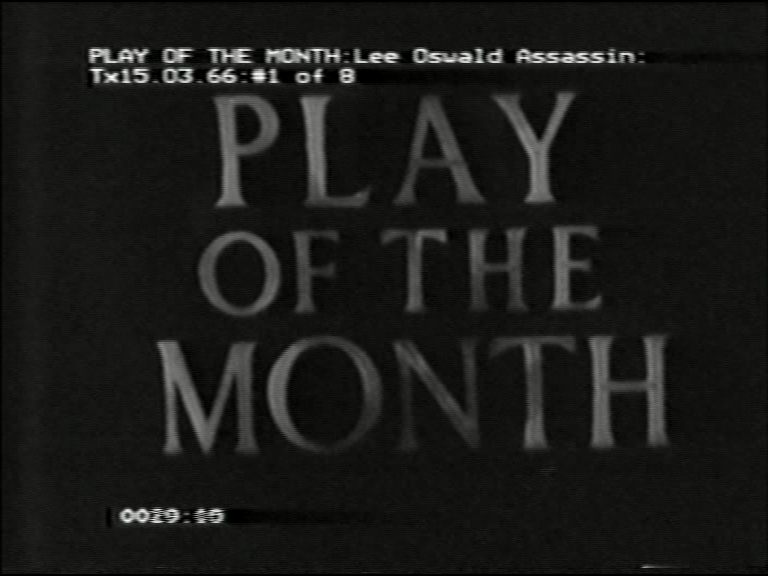 Play of the Month started in 1965 and ran until 1983. It is pretty much what it says it is. Play of the Month is an anthology series that would take plays and adapt them for television. It’s interesting with the progression of television as so much of the early output of the BBC in the 1940s and 1950s were basically plays. Yet, it was still decided that this would be a play to adapt to television. The entirety of the plot is a look at from the perspective of the Warren Commission findings. This was a group put together on November 29th 1963 to investigate the assassination of JFK. On September 24th 1964 the findings were made public in an 889 page report that found Lee Harvey Oswald was the lone gunmen in the assassination of JFK. It is not clear to me when this commission started to be criticized by the public or conspiracy theorists about the information and evidence that they left out. To be honest, I am not even sure what all that might be. Seeing that the Warren Commission report was so new by the time the play was being written that, I would think, no one knew, especially in Germany, to even think about questioning the contents. That being said, I would have to guess that any sort of idea of conspiracy in the whole matter had to be considered very early on especially after Oswald was assassinated by Jack Ruby two days after JFK was killed and was never even given a chance to go to trial. I am not sure what got Cartier to decide to adapt this play into a television production. Without being alive at the time, it is hard for me to gauge what the feeling of these events were like at the time, especially in the UK. 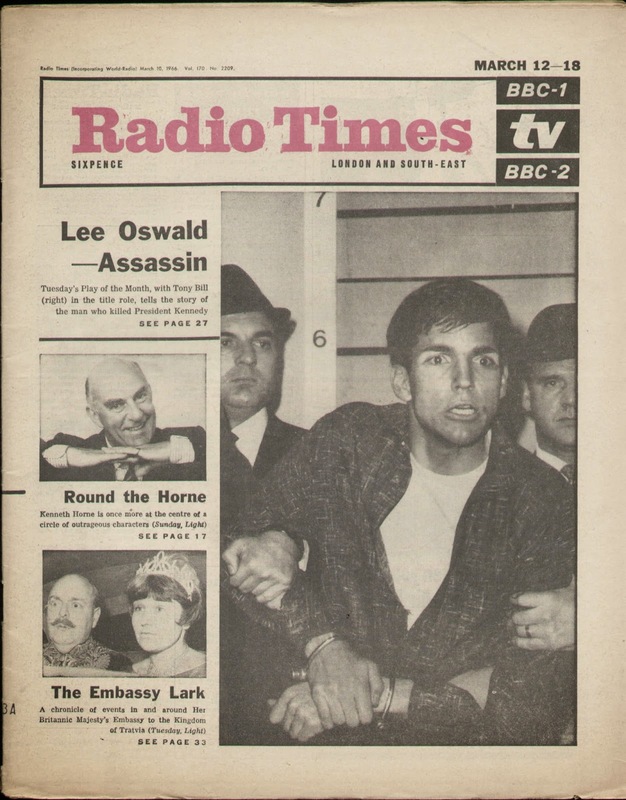 We are now past the findings of the Warren Commission by 1966 so it is interesting to see how many people in the British public were curious about the outcome. I have seen this play described as a docu-drama and I guess that seems accurate to me. I think docu-dramas can work a couple of different ways. I think something recent for example like An Adventure in Space and Time works relatively well taking true events and weaving a story out of it where sometimes multiple people are combined to one character or the events are perhaps a little more fantastical for dramatic effect. 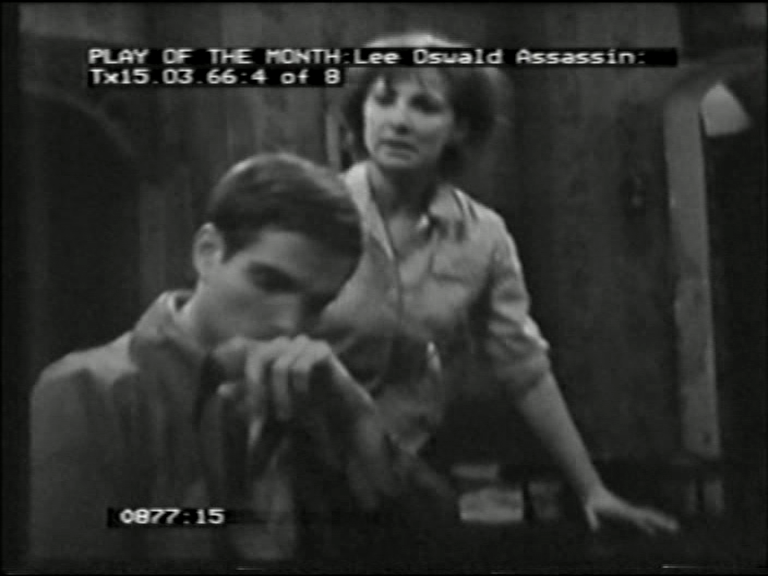 In the case of Lee Oswald: Assassin, it plays more like a limp and sterile educational film warning about the effects of Communism. I know the savvy of this group reading this article will point out that Oswald claimed to be a Marxist but I think the message still stands. In that regard, it makes it interesting because that makes it a product of its time; it is something that people could really relate to in the 1960s. Especially with the whole Bay of Pigs a few years earlier, I am sure not many people at the time knew of how Oswald admired Cuba and tried to get there so he can get back to Russia. The play starts with characters who attend the Warren Commission hearings to provide evidence of their interactions with Oswald. Once they start to tell their “story”, we go to that event they are recalling. Such moments are when Oswald did a horrible job while in the Marines and was not getting along with the rest of his platoon, he is immediately at odds with everyone because they see him as a Communist. Not only that but he is not taking his responsibilities seriously which has the rest of the platoon getting punished with him. We later move along to Russia at the US Embassy where Oswald wants to renounce is US citizenship. He is expecting paperwork to come from the Russian government to allow him to become a citizen. At the US Embassy, Oswald shoots off his mouth how he will never need to go back to the US again. He tells them to keep his passport. He doesn’t have the paperwork yet from Russia and the US cannot renounce his citizenship until other paperwork is made available. Oswald leaves in a huff. Once he is back to his apartment, he is visited by someone in the Russian government to inform him that he will not be allowed to become a citizen. This depresses Oswald enough to attempt suicide. His girlfriend intercedes just in time to save him but just imagine if she didn’t and he died. The world would have been a different place. Oswald finds a wife in Russia and impregnates her. They need to go back to the US. Once arriving in NY, there is a bunch of press waiting for someone for them to interview. Oswald thinks the press is there for him and he is angry when he finds out the press doesn’t want to talk with him. He believes he is the real story. He is also annoyed that he is told there are certain things he must do now that he is back in the US. This is just government red tape sort of things. Oswald clearly feels he is a special case and deserves better treatment than anyone else. Oswald finally moves to Dallas where his wife Marina has a very unhappy existence. She is raising a child and by the time we catch back up with them, she is very aware of his political beliefs and how his beliefs are actually hurting the family. We meet up with them again as Oswald loses a job but when he gets back to his house, he has a rifle. His wife does not respect him and she openly bad mouths him in front of other people such as their neighbours. She has had enough of her life with him. 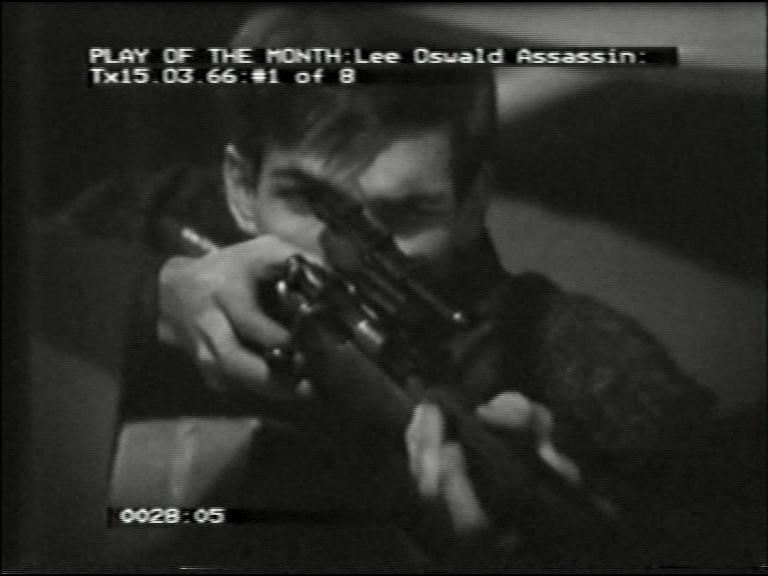 We literally cut to the next shot of Oswald at the book repository in Dallas on November 22 about to assassinate JFK. There isn’t a lot of buildup, we just see him shoot out of the window. I like that, it actually feels real time because it happens so fast. After that, we see him kill Officer Tippit and then gets caught. He is taken into custody. 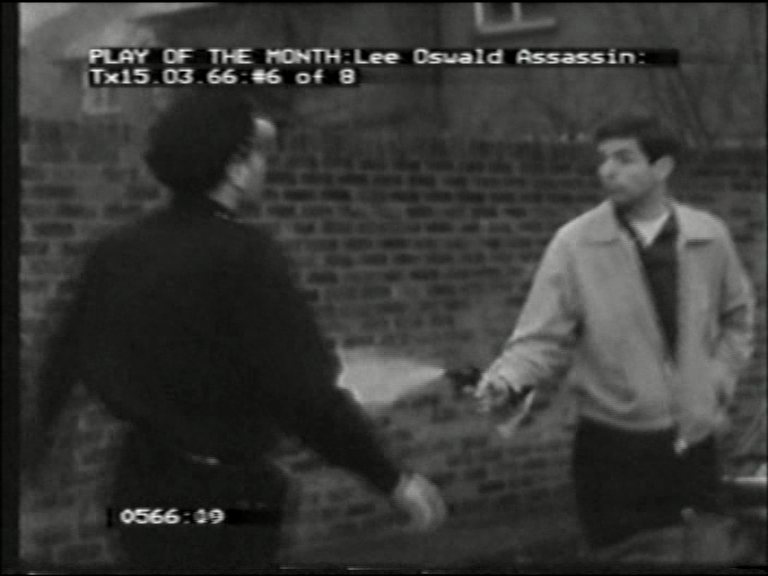 Oswald never admits to either of the killings but he is never given a chance. Jack Ruby assassinates Oswald the next day while Oswald is being transported out of the jail he was being held. I don’t go into much detail of the play because it is basically well-known history, at least as far as the Warren Commission is concerned. The play itself is really pedestrian. There is no energy or life to this production. It really goes through the motions of the findings of the Warren Commission. It is all very linear and clinical. This play was directed by Rudolph Cartier. He was one of the best BBC directors of the time. 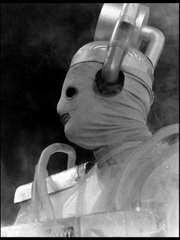 Many fans will know him from his direction of the 1950s Quatermass Serials, the groundbreaking 1954 production of Nineteen Eighty-Four and so much more. There is a held belief among many of the British television fans that I see online that Cartier can do no wrong when it comes to directing these productions. I think this proves otherwise. Everyone has a duff production eventually. There is literally no life to this production. We jump around and get little vignettes of the story. Not enough to make any real decisions about any characters. 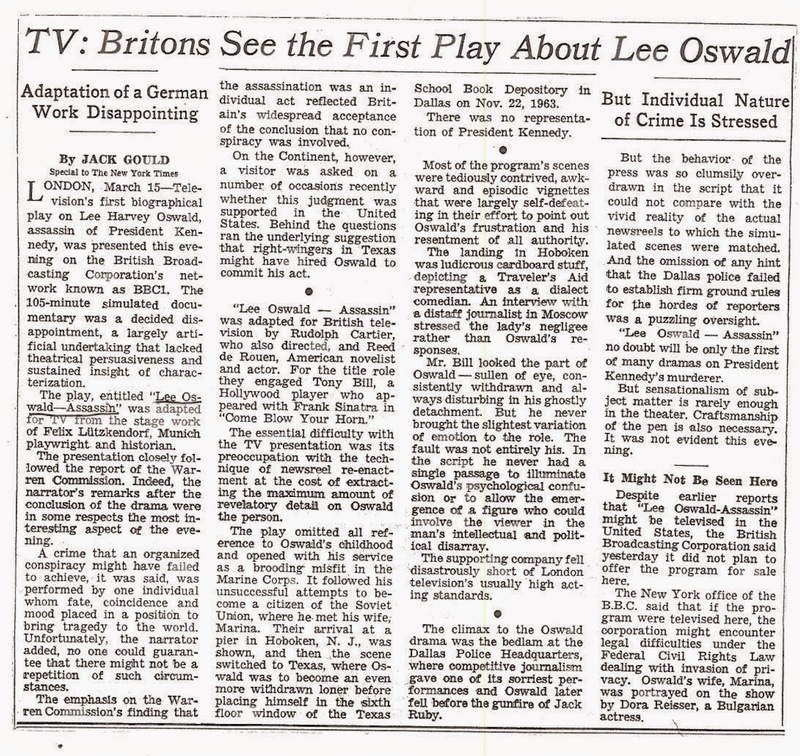 For most of the play, Oswald comes across as a harmless fanatic and nothing else. It’s not until his attempt on General Walker does it seem plausible that this guy is unhinged. I think the worse part of the play is that we jump to Oswald getting ready to shoot JFK but there isn’t a point where he has a reason. It comes across as completely random. That is where the problem lies with adapting this German play. 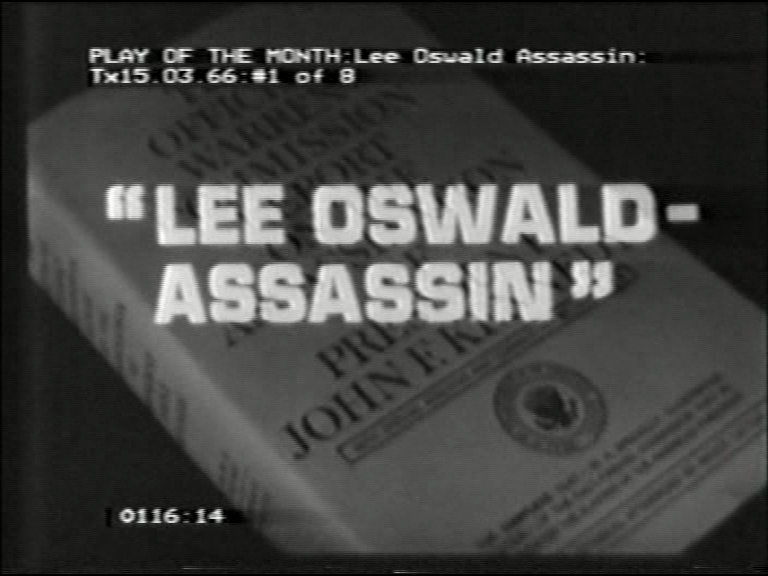 The play nor the Warren Commission have a real reason for why Oswald did it. There is not a moment in this play that Marina explains that she heard Oswald talk about assassinating the President. It could very well be that he woke up that morning to find out that JFK was going to be in Dallas that day and decided at the last minute to shoot the President only because Oswald realised that the motorcade was travelling right by where he worked. Everything that happened to Oswald could be down to pure unfortunate coincidence. The problem is that this story, if not being a straight documentary, may not work because it is so dry and adhering so closely to the Warren Commission report. There are some things I liked. Once Oswald is captured, the scenes at the police station where all pandemonium was breaking out with the press was really well executed. These are some obvious clues that this is a Cartier production. Crowd scenes that is filmed in a way of holding up a mirror to us. It shows how crazy we are when we are a crowd/mob. These shots of the press trying to get a word from Oswald is shot from the perspective of the police looking at this crazy crowd. It is really well-done. I also loved the police cars they used. It looks like something from Texas and not the car from Z Cars. 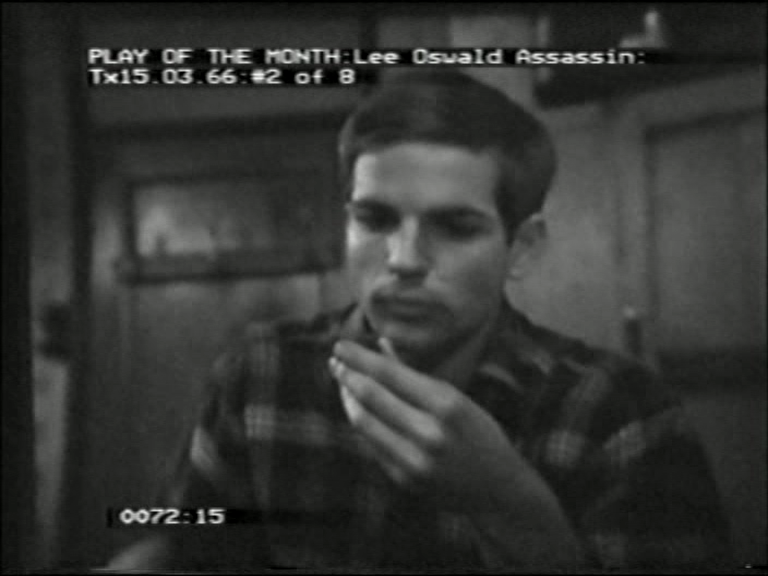 Tony Bill played Lee Harvey Oswald. He looks the part and plays it well. Rudolph Cartier wanted to make sure that Oswald was played by an American. Tony Bill later produced the film The Sting. We get Donald Sutherland in here as Charles Givens. He is the guy who talked with Oswald on the sixth floor of the book repository prior to Oswald shooting the President. There are some interesting appearance from people we’ve seen elsewhere. There is Warren Mitchell playing a Traveler’s Aide Rep in New York. He would soon be playing the role of Alf Garnett in Till Death Us Do Part. Carol Cleveland plays Barbara Davies who is one of the women that need to identify Oswald in a police lineup. Finally, we get a couple of Supermarionation voice actors with Shane Rimmer as a Marine Sergeant and David Graham who plays the shoe store manager who tips off the police about Oswald’s whereabouts. I have to admit, I didn’t have high hopes for the play. That being said, it’s an interesting curiosity. It’s interesting to see a UK perspective on such a defining moment in US history. It’s a shame that the play comes across as lackluster but not all the blame can be laid on Carter or De Rouen, the play seems to be where the problem really lies. The Oliver Stone film JFK may not be accurate but at least it’s entertaining. Next Week: We begin our look at some Christmas episodes of our favourite shows during the month of December. We start off with the Rowan Atkinson series The Thin Blue Line with their only holiday episode Yuletide Spirit.